When you HP printer, have paper jam, follow the next steps for detele complete this messenger and continue printing. It is a little frustrating when printing and suddenly the printer jams the paper just a few centimeters before finishing the process. As it is normal the printer will recognize there is a paper jam, and the fact is that when trying to print again we cannot because the printer is flashing and when being able to print it is the same document again. This error is usual when the printers are really old as well as the error when the printer pulls more than one page o does not pull any page at all, this does not mean that you must trash your printer, as said before it is not advised to do so with old printers. When a printer is getting old this one is also wearing out most of its pieces, and the one we will mention in not an exception this piece is in constant use since it indicates where to stop the cartridges, and where to start printing as soon as the printer is on. 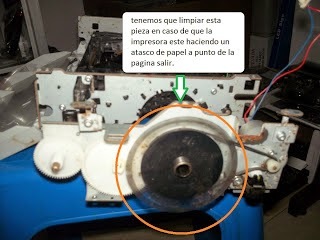 As you can notice this error is due to some unfinished process, in fact, because of the printer use it is possible that a piece called encoder strip is worn-out enough to lose its pins. Before starting the following steps indicated next it is recommended to unplug the printer from the power supply, you will have to introduce your hands inside the printer, to avoid electric shock that may hurt you it is better to advise to take every possible precaution. 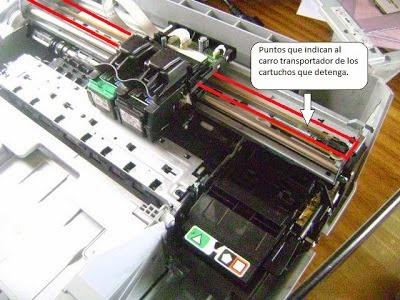 To be able to delete this error the printer is showing it is not needed to dismantle the printer completely, what you will need indeed is alcohol and some cotton or a napkin to clean the strip, mainly in the places where the pins are those are indicated with an arrow in the top or the previous image, know that in the left side there is also those pins that have to be highlighted. Doing this process it is possible to spill some ink and so it is advised to visit how to remove ink from hands and clothes. In case the problem persist after cleaning you will have to try by disassemble as shown in the previous image and look for the other sensor with similar function and clean it. After all this process if the printer continues showing this problem perform a cleaning of all the pieces the printer needs to print, if it is needed perform a maintenance and grease the tube where the cartridge carriage comes and goes through, after doing all that look in the printer menu if there is something that allows you to align the print head. In case of needing more help contact us.